I was worried that it would be a low-quality fabric, thin, and fragile as a lot of movie costumes are, but this vest was great! It’s an excellent, great quality material that definitely is what I was hoping for. 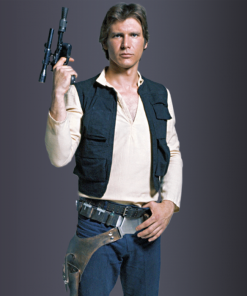 Star War Han Solo’s vest is accurately same as worn by the Han solo in his Star Wars franchise. I just loved it, the quality, the material and the fit. Happy with the purchase. I will definitely go to star wars cosplay event and wear han solo shirt and vest. This Han Solo Vest is inspired by Harrison Ford’s in “Star Wars”. This Star Wars Han Solo Black Vest has viscose lining stitched inside. There are four pockets outside and two inside and front zipper closing. Buy this leather vest now.